Researchers have developed a 3D printing technology that creates medical devices such as catheters for premature newborns and surgical implants customised according to individual patients. The biomedical devices they are developing will be both stronger and lighter than current models and, with their customised design, ensure an appropriate fit. One specific application of this new technology is developing patient-specific catheters, especially for premature newborns. “With neonatal care, each baby is a different size, each baby has a different set of problems,” said lead researcher Randall Erb, assistant professor at Northeastern University in US. “If you can print a catheter whose geometry is specific to the individual patient, you can insert it up to a certain critical spot, you can avoid puncturing veins, and you can expedite delivery of the contents,” said Erb. The new technology enables researchers to control how the ceramic fibres are arranged – and hence control the mechanical properties of the material itself, the researchers said. That control is critical if you are crafting devices with complex architectures, such as customised miniature biomedical devices. Within a single patient-specific device, the corners, the curves, and the holes must all be reinforced by ceramic fibres arranged in just the right configuration to make the device durable. This is the strategy taken by many natural composites from bones to trees. “We are following nature’s lead by taking really simple building blocks but organising them in a fashion that results in really impressive mechanical properties,” said Joshua Martin, a doctoral candidate at Northeastern University. Using magnets, Erb and Martin’s 3D printing method aligns each minuscule fibre in the direction that conforms precisely to the geometry of the item being printed. 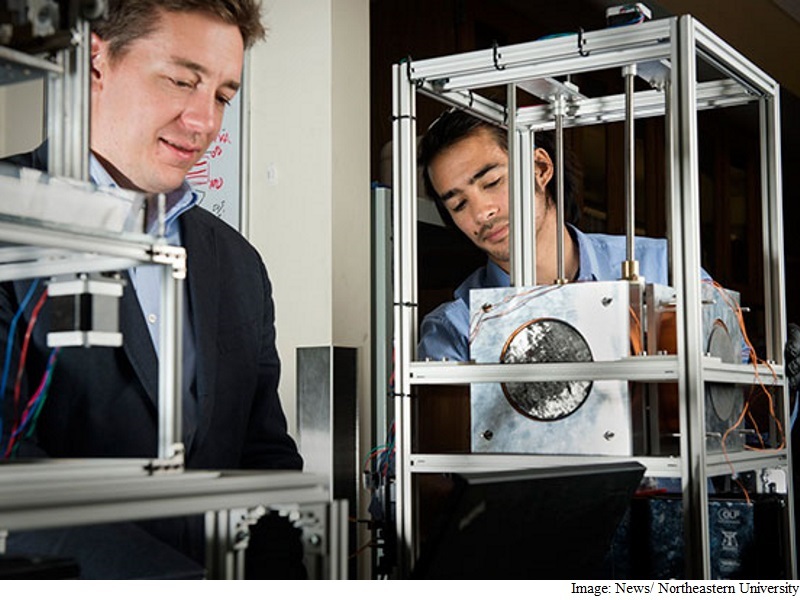 The magnets are the defining ingredient in their 3D printing technology. First the researchers “magnetise” the ceramic fibres by dusting them very lightly with iron oxide, which, Martin notes, has already been approved by US Food and Drug Administration (FDA) for drug-delivery applications. They then apply ultralow magnetic fields to individual sections of the composite material – the ceramic fibres immersed in liquid plastic – to align the fibres according to the exacting specifications dictated by the product they are printing. Finally, in a process called “stereolithography,” they build the product, layer by layer, using a computer-controlled laser beam that hardens the plastic. Each six-by-six inch layer takes a mere minute to complete.